Discover the fun of cooking with fondue. Capacity, 6 cups. Made of cast iron-painted red. 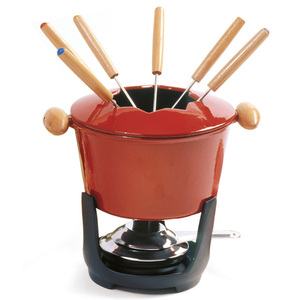 Set includes; fondue pot, lid, burner, stand and six forks. Recipes included. Hand wash, rinse and dry - never soak cast iron. 10 Pc Set.